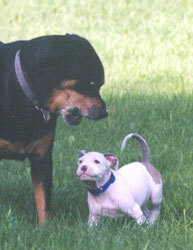 July 15, 1999 - Joxer at about 9 weeks old with his Rottweiler pal, Boomer. 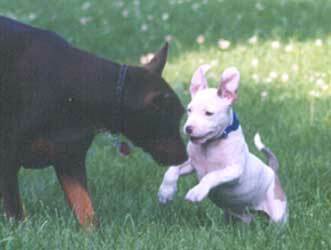 July 15, 1999 - Playing in the yard with Mako. 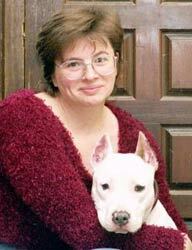 Joxer is an American Staffordshire Terrier puppy bred by Midwest Kennels and about 9 weeks old in this picture. 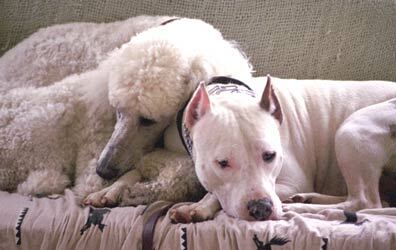 July 15, 1999 - Now you can see why we decided to crop Joxer's ears! December 19, 1999 - Joxer is named, of course, for the character played by Ted Raimi in the TV show "Xena, Warrior Princess." The TV Joxer was sweet, enthusiastic, hilarious and devoted - my Joxer is the same. 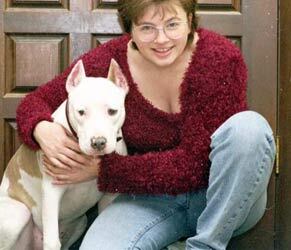 October 15, 2000 - This is a Mastiff that almost came to stay. 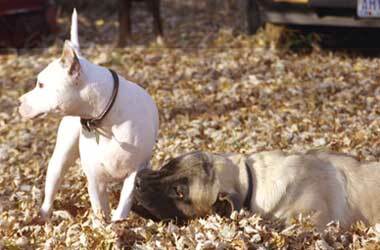 He and Joxer wore each other out. 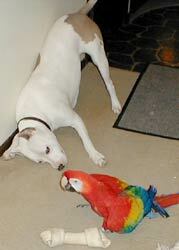 January 1, 2001- I wouldn`t recommend this pairing as a general practice, but at the time we had one lonely Amstaff and one rowdy Scarlet Macaw. January 1, 2001 - You just have to believe me when I promise you that these two enjoy this. I've actually seen her putting her head right into his mouth and picking his teeth. 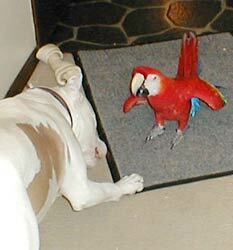 January 1, 2001 - Joxer is the only dog Joony hasn't been able to intimidate. 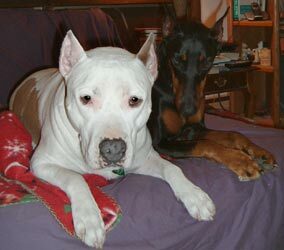 And the only playmate she hasn't driven away. 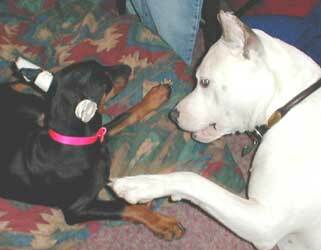 March 19, 2001 - Joxer was so polite to Lola when she was a little grub. He still is... but she does not extend him the same courtesy! October 8, 2002 - Smile for the camera. 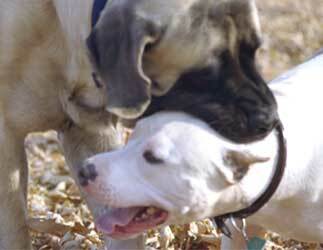 Oct 31, 2003 - Apparently Lola is really good at ear washing. 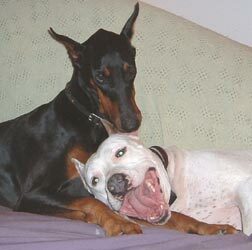 Feb 3, 2004 - The boy and the girl.